It was my first time back to Berchtesgaden since high school, when I had come here a couple of times for a skiing trip in the winter. No it was summer, and there was little or no snow - or so I hoped - on the summits surrounding the town. After a nice night in the very friendly Hotel Bavaria, I got up at 5am and arrived at the trailhead about one hour later. By 6:15 it was just getting light and I was on my way. It was already light enough that I left my headlamp in the car. No need to carry it around all day. The trail was very steep initially but after about 10 minutes merged with a forest road that led up the mountain rather gradually in wide switchbacks. I came to another interesectio soon thereafter where the trail was supposed to leave the forest road again, but a big sign decleared the hiking path to be closed because of measure that were being undertaken to combat the pine beetle (Borkenkaefer). I had no idea whether those measure involved spraying with insecticides, but just to be on the safe side, I decided to follow the recommended (and longer) detour via the ????Alm. Soon, I was able to see the little Watzmann and the main Watzmann and the Watzmannhaus, which I was hoping to reach quickly as it was the starting point for the actual hike to the summit. When I reached the ??? ?Alm after about 1h15, the forest road ended and a small path led up the switchbacks to the house, where I arrived about 2 hours after setting out. I was pretty out of breath at this time and decided to take a 15 minute break (and drink two Apfelschorles) before continuing the hike. The Watzmannhaus is located at 1900meters, which meant that I had done about 1400meters in 2 hours. Not bad for any day's work, and it wasn't even 9am yet. The first of three summits, the Hocheck, is located at about 2600meters and I arrived there about 4 hours after leaving the car. After leaving the Watzmannhaus I slowed down considerably, because my quick hike up to the hut had tired me a bit and I knew that it would still be a long day if I wanted to do all three summits and then descend from the mountain on the back side to return to the car in one big loop. The hike up to the Hocheck was straightforward. It was not too steep and only a few sections were secured with a rope. The Hocheck is the final destinations of most visitors to the mountain as it is not a technical ascent and it makes for a nice outing from the hut. Numerous people and also a number of families with younger children were proof of the attractiveness of the Hocheck. There is a small refuge at the Hocheck, which I used to put on my Via Ferrata gear, which would become essential over the next two hours on my traverse from the Hocheck via the middel summit (and highest point on the mountain) to the south summit. It only took about 30 minutes to get to the middle summit. I probably would have covered that distance more quickly it it had not been for all the people in the via ferrata and the resulting jams at crucial sections. 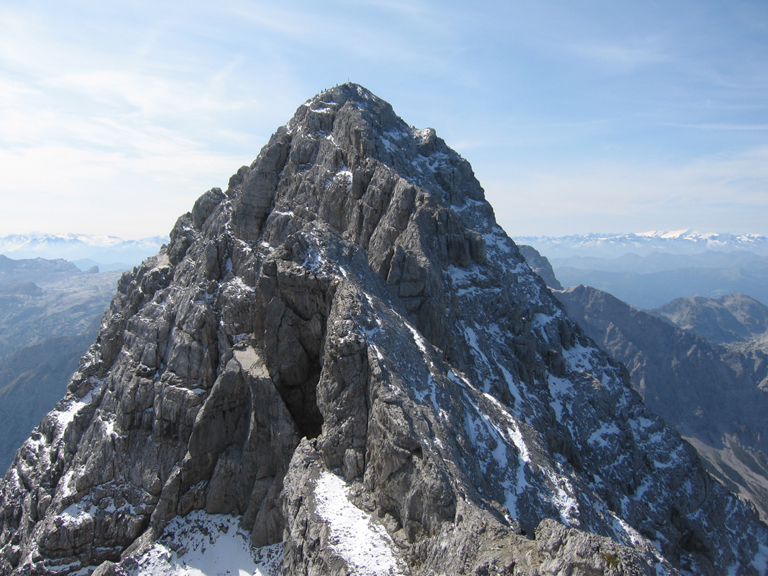 To make things worse, some hikers did not want to go further than the middel summit, and thus were on their way back to the Watzmannhaus. This meant that there was some heavy two-way traffic which contributed to yet more jamming at the crucial sections. However, it was a nice day, the surrounding scenery was absolutely magnificent and I did not mind at all being suspended by two carabiners at a steel cable at 2700meters with a drop of a couple hundred meters on either side while I waited for the jam to clear up. Interestingly, two helicopters were circling the mountain for a couple of hours while I was doing the traverse. Apparently, they were looking for someone, but I never figured out for whom and why. An internet search at home after the trip yielded nothing, and I just hope that whoever they were looking for got off the mountain alright. At the middle summit, I took again a 5 minutes break to prepare myself for the last and third stretch of the traverse. The path along the crest dropped a hundred or so meters and then went up and down the ridgeline before leading up again to the south summit. By now there were far fewer people on the via ferrata (or I had left them all behind me) and only on two occasions did I have to wait for somebody moving up a sketchy section of the traverse. I moved slowly and carefully, because the trail was very exposed in places before arriving at the south summit exactly 6 hours after leaving the car. Especially on the last two sections before reaching the south summit did I get the impression that I was underprotected. There was a fair amount of snow and ice on the rocks which made the whole undertaking quite slippery and in those two sections there was no steel cable for clip into. I managed to get through those sections without problems but it was at the limit of what I am feeling comfortable with. Another guy unddered remarks to the same effect and maybe as I am writing this a week after the hike my impression is mainly influenced by what he said at the time, but it was a bit sketchy, no doubt. There were about 15 people at the south summit, celebrating their successful traverse with some candy bars and water. As more people kept arriving and noone got up to leave the summit area became a bit crowded and after taking many pictures and a few summit shots of myself, I decided to get a headstart on all these people on getting off the mountain. In order to complete the traverse one descends from the summit at 2700 meters down to the Wimbachschloss at 1300 meters over a fairly short distance. Consequently, the descent was very steep and lots of loose rock and debris was just waiting to be kicked loose by an upper party onto a lower party. Therefore, I found it best to bring some distance between me and the summit, while none of the other groups were gettign ready to go down. I followed the red and white circles marking the way down, because no clear trail was visible. Even with the markers I began going down a wrong chut before realizing my mistake, that's how faint and not immediately visible the direct way down was. After about 30 minutes I reachec some patches of grass and knew that the hardest part was behind me. The slope levelled out somewhat before dropping down again quite steeply with a further assortment of chutes. I looked back up the mountain and saw the summit way above me. Strangely, I did not see another party making their way down from the summit. Surely, by know, I thought, others must be on their way. Either they were hidden by the rocky nature of the mountain or there must be another way done. Later I found out that indeed there was another way up and down, a via ferrata along the eastern side of the mountain. Hmm, maybe all those people I had seen on the mountain were heading down that way. But it did not matter, I was well on my way and after about 1h15 and some obnoxious scree at the end I finally reached flat ground in the form of a dried up riverbed. Or so I thought. What it actually was was the damage of a few gigantic avalanches followed by a couple of spring floods that had completely eroded the top soil and any plants that come with his on a width of about 100 meters or so. Quite dramatic and it would go on for the next 10km or so. For the next 30 minutes I actually walked in the "river bed" before I arrived at the Wimbachschloss, which miraculously had escaped the avalanches. I stopped for yet another glass of Apfelschorle and then began my long track back (about 2 hours) on a well maintained path to the trailhead. At some point I realized that the electricity poles supplying power to the Wimbachschloss were numbered. The numbers started probably with 1 at the trailhead and when I realized the system, I had just passed pole no 145. I estimated that they were placed about every 25 meters, which meant that I had to hike another 6 km more or less to get back to the car. Probably more, because the powerlines were put up in one straight line and the trail was not. Oh well, what can you do. The trail was ok, just sloping downhill slightly, and easy to walk on. I passed through more area devasted by either avalanche or flood or both and saw some of the breakers installed to slow down the flow of the water and eventually presumbably repopulated the area with plant life. However, there was a long way to go. Exactly 10 hours after setting out, I returned to the trailhead and immediately returned to Berchtesgaden. At the excellent Hotel Bavaria, they were so friendly as to let me take a shower. Thus, I was clean and freshly dressed when I headed northwest on my way to Stefan and Julia's house, where I arrived 90 minutes later and spent the night.